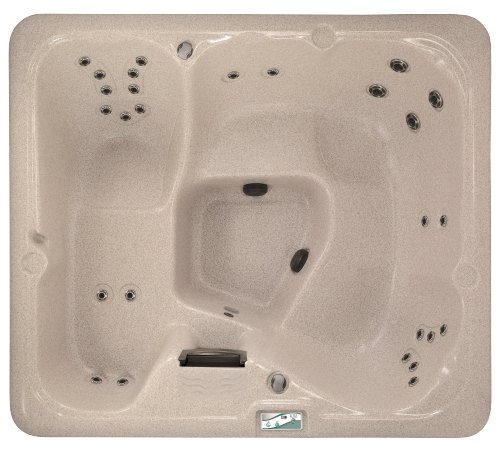 Offering great value for money, the Vita Spa Voeux is a five seater hot tub, boasting high powered and adjustable Graphite Jets, powered by a 5hp pump in conjunction with cartridge filtration. The Vita Spa voeux has seating for five people and is designed to offer relaxing lounger positions and corner seats with massaging water jets and a controllable Air Venturi System. A great hot tub spa with generous seating for five people, making it perfect for the family at home or in your holiday cottage. A highly energy efficient base helps to retain the heat of the 1188 litres of water whilst the water feature and Ait Venturi System ensures that you can plunge into the deep water and fully relax, letting the high powered water jets massasge away the aches and pains. The staff at Bay Spas hot tubs in Devon provide a professional and friendly service, allowing you to try out any of the hot tubs in the showroom so you can see for yourself why the Vita Spa range is so popular.